Earlier in 2017 my son and I started planning our annual camping and fishing trip for the middle of July. We decided to go to Yellowstone and Glacier Parks fishing our way to and from the parks on several major rivers (some containing whitewater sections). While my fifth wheel camper has a welded hitch to pull a drift boat behind it, we decided that this would be too cumbersome for some of camping areas that had limited parking space. So we began our search for ideal watercraft that would work for our trip. We thought about taking individual pontoon boats and decided against that since they would take up so much room and my son is not an experienced oarsman. We needed a two-person watercraft and something that we could place on, in the camper or in the back of truck in front of the fifth wheel hitch. 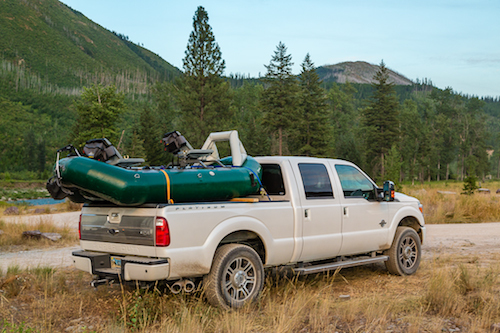 Being a dealer for Outcast Boats, we decided to research the different two man rafts and pontoon boats available that we could assemble and inflate once we set up camp. Most we looked at had rower frame platforms, which would not work for our purpose. So I called Chris at Outcast and told him our predicament and he suggested we look at the new Outcast OSG Striker two-man raft. It was perfect for what we were looking for. The Outcast Striker Raft weighed 100 lbs. and when the seats and oarlocks were removed it could be rolled up. So I had Chris send me a set up which included the Striker Raft, upgraded Cataract Oars, upgraded brass oar locks, k-pump, and air blast pump that runs off a car battery. Once we received everything we proceeded to put everything together in my garage. There are two different types of seats that come with the raft and of course we put them on backwards. One seat swivels and one does not. The swivel seat is for the fisherman in front of the raft and the stationary seat is for the rower position. The next thing we did wrong and learned the hard way is that you should assemble the seats to the raft before you inflate it as there is not much tolerance to assemble the seat frames to the raft even when it is deflated. Other than that it went together rather quickly and easily. Now we had to figure out how to transport the raft to and from the water. With the fifth wheel hitch in the bed of truck we had to figure out a way to put the raft above the hitch. Not too hard! We just cut a 2x4 that fit across the back of the pick up bed so that the front end of the raft could rest on it while the rear of the raft rested on the tailgate. Used a couple of ratchet straps to hold the raft down during transport. (Note: the raft will easily fit into the bed of a full sized pickup if you don't have a hitch). Next we needed to see how we could store the raft. When deflated and disassembled it rolled up into about a 4 foot diameter ball which we discovered would fit inside the camper as well as in front of the fifth wheel hitch (which is the option we used for the trip). The oars, seats, cargo pockets and accessories all fit nicely in the camper storage compartments. With logistics solved we headed off on our trip. First wade fishing our way through Yellowstone on Soda Butte, Slough Creek and the Lamar River. Then on to Glacier Park and found there was not much river fishing within the park (thus they do not require a park fishing license like Yellowstone). Next on the agenda was the Middle and North Forks of the Flathead River. Hit a local fly shop (which will rename nameless) in West Glacier and discovered how proud they were of their shuttle services. Anywhere from $80 to $170 for the sections we were interested in, which was of course ridiculous. All other areas of the country I’ve visited shuttles range anywhere from $20 to $25. So I gave up on the idea of floating the Middle Fork of the Flathead and decided we could camp along the North Fork of the Flathead, with the idea of meeting other floaters/campers that would be willing to share shuttles. It was a brilliant idea and we did meet several nice folks that helped us out. 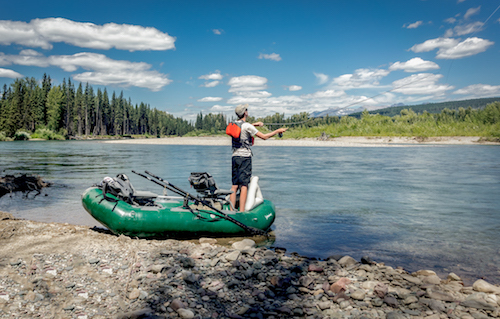 North Fork Of The Flathead River from mark boname on Vimeo. We assembled the raft and were off for our first float. The first thing we discovered was that we had not inflated the raft enough (you will know quickly as the seat frames will sag into the raft. You have to inflate the raft rock hard). After hitting all the chambers with our K-pump the raft seemed to maneuver effortlessly and handled some class 2 rapids with ease. We did not find any class 3 rapids on the trip but I would not hesitate taking the raft through any if you are an experienced oarsman. The upgrade on the bass oarlocks also became a problem as the edges of the oarlocks were too sharp and cut through the rope wraps on the Cataract Oars in one day. I managed to salvage them with a little duct tape and used the standard oarlocks that come with the raft for the remainder of the trip. While I recommend having a spare oar and oar lock especially for whitewater, I would not recommend upgrading to the brass oarlocks until they are changed. We also floated a couple days on the Madison and we were very please with the overall performance and comfort of the raft and the ease to fish from it. Something else we discovered was with a shallower draft and no fear of hitting rocks, we could go where other normal hardsided drift boats could not. We also looked at a similar watercraft from another company and realized it was not self-bailing which is an important feature to look for when looking at a whitewater craft. 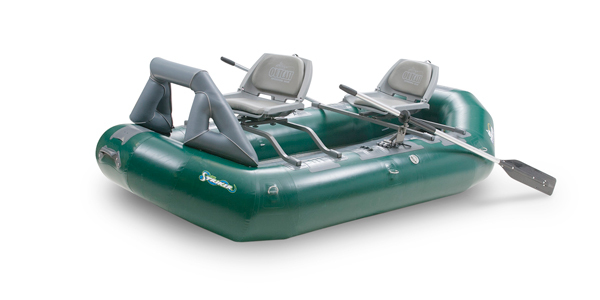 If you’re looking for a two man raft that is easy to transport, easy to assemble, can handle whitewater, and easy to row and fish from look no further!